As a kid, I remember some games just being too hard to finish. Growing up with the NES meant experiencing "NES hard" first hand. It took forever to beat Ninja Gaiden, and that was something that was likely not repeated. Beating Mike Tyson was newsworthy at the bus stop. Beating Contra without the Konami code could make you a legend. But for every NES game that was beatable, there were many that were not. Today there exists a method to play modified, or hacked games using IPS patching. I am not a computer programmer, but essentially an IPS patch is code that can be attached to existing rom code, changing the rom file. These IPS patches are already written by contributors to online forums and websites. Be advised that the method I use to play these is with an Everdrive so that I can play on original hardware, but the same method can apply to emulators. I wrote a post explaining Everdrives here. When I first heard about this, it seemed like it might be too technical, and required a lot of programming know-how. The process is actually pretty easy, if you have the right tools. This is how it works. 1) Download a rom of a game that you own (I am assuming most know how to do this, if not, Google is your friend). 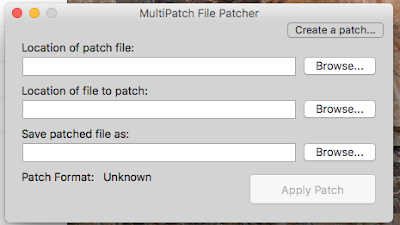 2) Download a IPS patching program (again, Google) like Multipatch, Lunar IPS, etc. 3) Go to Romhacking.net. Click on rom hacks on the left hand side. Choose whatever filters you want to help you find the available rom hacks for your game. I chose Ninja Gaiden III: The Ancient Ship of Doom - Restored as the original was a bit to harsh for my liking. This rom hack lowers the amount of damage that you take, gives unlimited continues, and adds a password feature. That last piece may not be all that necessary today, since you are not playing on an original cartridge and can use save states, but hey why not? 4) Open the IPS patching program. I am a Mac user, so I used "Multipatch", but there are others out there, and they generally work the same way. Select the patch on your computer, select the rom, give it a name and save location, click apply patch, and done. You can now load this patched rom onto your Everdrive or Retropie, or whatever. This ability breathes new life into games that were formerly thought of as unplayable. Hacks provide all kinds of tweaks, improvements, and other curious effects. A well known example is the hack to make Castlevania 2: Simon's Quest more playable by providing clearer hints from villages, making invisible pitfalls visible, and speeding up night/day transitions. These improvements make the game vastly more playable, and into an enjoyable experience. This is just one example of the possibilities. Another major benefit is to apply translations to games that were never released in English speaking territories. I know that this is especially helpful to fans of RPGs. I myself prefer action-oriented games, so text is not that much of a factor in gameplay, but I could do it if I wanted to. For owners of the premium SD2SNES cart, you can apply MSU patches to add cd-quality audio to Super Nintendo games. Super Metroid, A Link to the Past, and F-Zero are shining examples of this done right. Be advised that these patches are larger, since they are audio files, but if you have an SD2SNES cart, you probably already know this. Genesis owners can get in on the action as well. The process is identical, regardless of which cartridge console you have. I personally prefer the Japanese version of Contra: Hard Corps, which has three hit points per life. This feature was removed for the North American release, but now you can restore that feature! Notice the three hit points underneath the shot type. Another type of hack that is gaining popularity are color restoration hacks. For example, The Genesis' color palate for Golden Axe is slightly different than the arcade version. The color restoration hack modifies the colors to better match the original. A subtle effect, but it interests people enough to make them. The ground coloration is more subdued in the color restoration hack of Golden Axe. New rom hacks are added all the time, and some games have a plethora or rom hacks like Metroid, Super Mario games, Zelda, Contra, and so on. I particularly enjoy rosters updates to Super Tecmo Bowl. Super Mario World Return to Dinosaur Land is a popular rom hack. I hope that some of you found this helpful. For older gamers who appreciate original hardware like me, this is a fascinating ability and makes the hobby that much more enjoyable.